Exporter of a wide range of products which include 8 channel analog demultiplexer, measurement of temperature using semiconductor, 8 channel analog multiplexer, ac tachogenerator trainer, anemo meters ( wind velocity) and data acquisition system demonstrator. 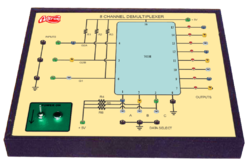 * Demonstrates the principle and working of an 8 Channel Analog De – Multiplexer. 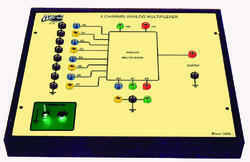 * A dedicated 8 channel de – multiplexer IC (DE – MUX CD4051) is used. * Facility to select channel and data is provided. * Built – in IC based DC Regulated Power Supply with short circuit protection and LED indications for Supply “ON”. * Housed in an elegant cabinet with a well spread intelligently designed circuit layout on acrylic front panel. * Strongly supply by a comprehensive instruction manual complete with theory and operation details. ADTRON’S Measurement of temperature using IC is a versatile self contained stand alone unit, useful in the demonstration of the principle and working of a temperature indicator using ‘Semiconductor transducer AD 590. 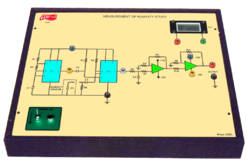 The unit consists of a constant current source, percision amplifier, signal conditioning circuitry and digital readout are provided. The trainer is enclosed in a specially designed user friendly elegant powder coated metal cabinet with intelligently designed layout on imported acrylic front panel, are some of its other features. Measurement System : Transducer with electronic instrumentation. Sensor Range : 0 to 1000C. Actual Heating Process : Heating unit of 200W capacity (with lamps). Readout : 3.5 digit digital display to indicate temperature in 0C. Connectors : 1) For IC sensor. 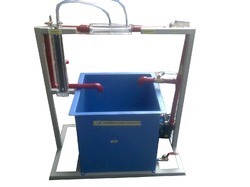 * Completely self contained stand alone unit. * Demonstrates the principle and working of an 8 Channel Analog Multiplexer. * A dedicated 8 channel multiplexer IC (MUX CD4051) is used. * Built-in IC based DC Regulated Power Supply with short circuit protection and LED indications for Supply “ON”. ADTRON’S A.C. Tachogenerator demonstration unit is a versatile unit which includes a D.C. Motor and an A.C. Tachogenerator coupled to it Provision is made to observe the A.C. voltage on C.R.O. and the same can be measured on the display provided. 1. D.C Motor : Bi-directional, Foot mounted. Rated Speed : 2500 rpm. Input : 0 – 12V D.C.
Output : 0 – 2500 rpm. 2. A. C. Tachogenerator : Rated Speed: 4000 rpm. Output : 20 V. at 1000 rpm. Shaft Length : 30 mm. ADTRON’S Characteristics of Anemometers ( Wind Velocity ) is a versatile stand alone unit useful in the study and demonstration of the principle and working of a Anemometers ( Wind Velocity ). The trainer consists of the sensor housed in a handheld unit, instrumentation circuit, LCD display, a wind tunnel and control to vary the wind speed in the tunnel, all this is housed in an elegant cabinet with a well spread intelligently designed layout on front panel. A comprehensive instruction manual covering complete with theory & operating details. * Parameter Measured : Wind Speed in m/Sec. * Sensor : IR Transmitter & Receiver. * Wind Generating Instrumentation : Using a high speed fan fitted at end of the wind tunnel. * Wind Variation : By changing the speed of the fan. Microprocessor Data Acquisition System is a highly versatile system that offers the user number of facilities like selecting the scan rate, displaying selected channels through keyboard. It can also be interfaced to PC and the data can be transferred to the computer where it can be used for analysis. A to D converter used has 8 bit resolution and as such accuracy of the order of 0.025% can be achieved in ADC. The number of channels that can be scanned & eight ( 8 ). The data can be stored on line in the memory and printed off line. The display however is ON line. 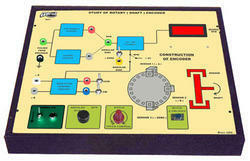 Analog input simulations module is provided. * Demonstrates the principle and working of a FET voltmeter. * Built – in two range voltmeter ( 0.5V & 1.0V f.s.d ). 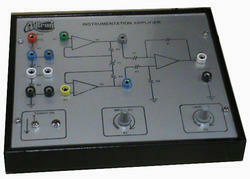 * Built – in FET unity voltage gain buffer amplifier for high input impedance. * Built – in bridge circuit for zero quiescent voltage across meter. * Built – in source follower for minimum drift with zero correction potentiometer. 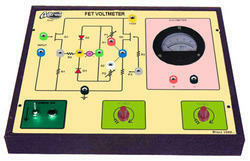 * Helps in understanding the advantage of FET voltmeter over regular analog voltmeter. The LCR Bridge Trainer should be able to measure the unknown resistance, capacitance or inductance using AC Excitation source. 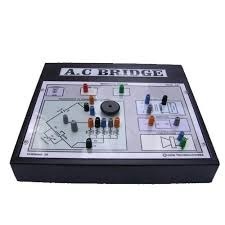 The LCR Bridge Trainer should be modularly designed and should be a self – contained system. The trainer should have built-in AC Excitation source. The required detector should also be built-in. All the terminations should be provided on 4 mm sturdy brass terminals, fitted on front panel with powder coated metal enclosure for longer life. 3. Maxwell’s and Hay’s for Inductance. ADTRON’s model 3064, Measurement of Flow using Orifice system demonstrates the principle and working of a rotameter. 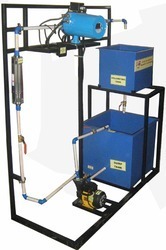 The system consists of a sump tank, water pump, rotameter, ball waves and necessary piping all mounted on a suitable stand. The whole unit is a table – top unit. 1. Study the principle and working of a Orifice. 2. Measurement of flow using Orifice. 3. Measurement of friction loss of a Orifice. ADTRON’s model 3062 Measurement of Flow by Rotameter system demonstrates the principle and working of a rotameter. The system consists of a sump tank, water pump, rotameter, ball waves and necessary piping all mounted on a suitable stand. The whole unit is a table – top unit. Rotameter I : 35 LPM in line Rotameter. Rotameter II : 35 LPM as Reference. 1. Study the principle and working of a Rotameter. 2. Measurement of flow using Rotameter. 3. Measurement of friction loss of a Rotameter. * Construction and study of the principal & working of a Frequency to Voltage ( F to V ) converter. * Study the working and verify that the output voltage is proportional to the input frequency. * Study the effect of various parameters on the output. * Completely self-contained stand-alone unit. * Built-in D.C. 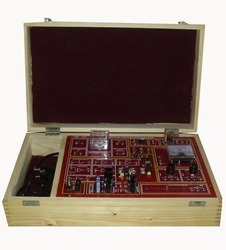 Regulated ( ve & -ve) power supply for op-amp with short circuit protection and LED indication for supply “ON”. * Demonstrates the principle & working of an Instrumentation Amplifier. * Measurement of Common mode gain and Differential mode gain of the instrumentation amplifier. * Measurement of CMRR of the Instrumentation amplifier. * Strongly supported by a comprehensive instruction manual complete with theory & operating details. The ADTRON’s Level Measurement by using Air Purge systems is a versatile and stand alone system useful for demonstrating the indirect measurement method of measuring level of water in mmwc. 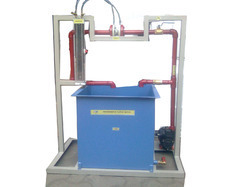 The unit consists of a transparent cylindrical tank, calibrated pressure gauge in mmwc, air regulating valve, etc all mounted on a powder coated platform. Air supply should be provided by the user. Comprehensive instruction manual complete with theory and operating details is provided along with the unit. Level Indicator : Pressure gauge calibrated in mmwc. Air Regulator : 1/4” air regulating valve, leak proof. 1. Study of Level measurement using back pressure. measurement ( indirect measurement technique ). ADTRON’s model 3063 Measurement of Flow by Venturimeter system demonstrates the principle and working of a rotameter. The system consists of a sump tank, water pump, rotameter, ball waves and necessary piping all mounted on a suitable stand. The whole unit is a table – top unit. 1. Study the principle and working of a Venturimeter. 2. Measurement of flow using Venturimeter. 3. Measurement of friction loss of a Venturimeter. Adtron’s Humidity Measurement Trainer is a versatile self – contained stand – alone unit useful in the study and demonstration of the principle and working of a Humidity sensor. It has a built in sensor, amplifier, instrumentation circuit, humidity chamber with humidifier. A supplementary dry / wet bulb thermometer is also provided. Display : 3 ½ digit digital display. 4. Supplementary dry / wet bulb thermometer. 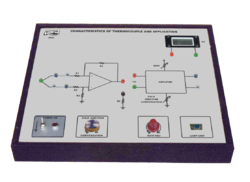 The Adtron’s Microcontroller based PID control trainer is a completely self contained stand alone unit useful for the students to understand the concept of Proportional, Integral and Derivative control system. The system consists of the main controller unit, sensor and lamp type heater unit. The system is housed in an elegant powder coated metal cabinet with block diagram on the front panel. It is strongly supported by a comprehensive instruction manual complete with theory, and operating details. ADTRON’S Optical transducers trainer kit play a very important role in today’s industrial and domestic applications. 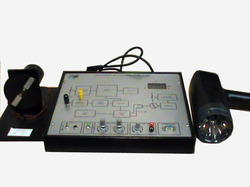 Optical transducer trainer is unique in design as it covers, study of 4 different types of transducers. Experiments covering fundamental characteristics of transducers and study of transducer controlled switching / alarm systems can be performed. The manual consists of various chapters covering Introduction, Theory Types and selection of transducers, their applications and Glossary of terms. 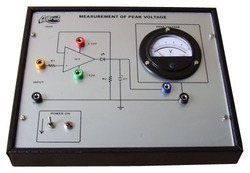 * Demonstrates the principle & working of Peak Voltage. * Demonstrates the principle & working of Root Mean Square (R. M. S) Value. ADTRON’S Rotary Encoder : Study system demonstrates the principle and working of a specialized dedicated transducer known as Rotary Encoder and also shows its application as angular position measurement and speed measurement. The rotary encoder is coupled to a dual shaft motor, variable source for varying the speed, position measurement and rpm instrumentation circuit and digital readout are all enclosed in a specially designed user friendly elegant power coated metal cabinet with intelligently designed circuit layout on imported acrylic front panel, are source of its other important features. Parameter measured: Angular displacement with clockwise, anticlockwise indication. Measurement system :Rotary encoder coupled with motor. 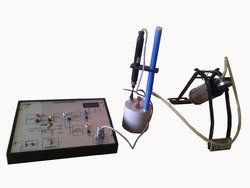 : Transducer with electronic instrumentation. Pulses per revolution : 360. Actual Measurement : Manually for angular displacement. : Varying speed of motor for RPM measurement. 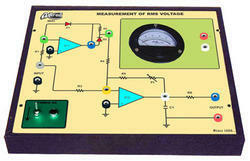 Circuit : Variable DC source for motor, selection of angular & RPM measurement, conditioning circuit and digit display. * Construction and study of the principal & working of a voltage to frequency ( V to F ) converter. * Study the working and verify that the output frequency is proportional to the input voltage. ADTRON’S Measurement of Speed Using Stroboscope trainer is a versatile stand alone unit useful in the study and demonstration of the principle and working of a speed measuring system using stroboscope. 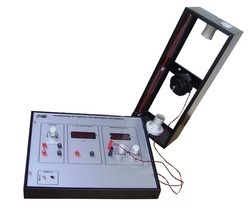 The trainer consists of the complete instrumentations viz, stroboscope, with digital display to indicate the speed in revolutions per minute ( RPM ). It also has a motor speed controller. The motor unit with a toothed wheel mounted on it is separately housed. 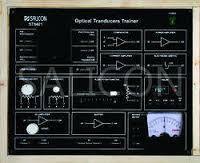 The trainer is housed in a specially designed user friendly elegant cabinet. * Motor : Specially designed bi directional permanent magnet armature controlled DC motor. * Speed : 2500 RPM Meter. * Parameter Measured : Speed in RPM. * Speed Control : Built – in solid state speed controller voltage based. * System Range : 250 – 2500 RPM max. * Instrumentation : Xenon flasher with associated circuitry and digital display. * Controls : 1. Speed Control. 2. Mains ON / OFF. Adtron’s Bourden Type Pressure Transmitter System Demonstrates The Principle And Working Of The Specialised Dedicated Transducer Known As “linear Variable Differential Transformer ( Lvdt )” , And Also Shown Is One Of Its Unique Application To Measure Pressure. 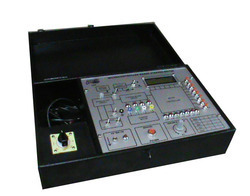 A Special Arrangement To Vary The Displacement Accurately, A Variable Excitation Source, Electronic Instrumentation And Digital Readout All Enclosed In A Specially Designed Users Friendly Elegant Powder Coated Metal Cabinet With Intelligently Designed Layout On Imported Acrylic Front Panel, Are Some Of Its Other Important Features. Transducer : Bourden Tube C Type With Lvdt Coupled To It. Type : C Type Bourden Tube And Spring Loaded Core Type Lvdt. Measurement Range : 0 To 10 Kg. 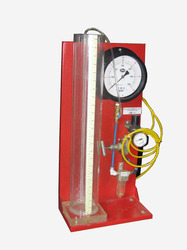 Actual Pressure Displayed : On Pressure Guage Fitted In A Chamber. 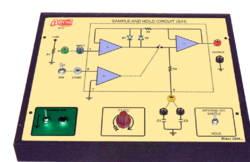 Circuit : Ac Excitations Source, Phase Detector & Digital Display. ADTRON’S Temperature Transducers Trainer is a versatile self-contained stand alone unit, useful in the study and demonstration of the principle and working of a temperature indicator and controller. 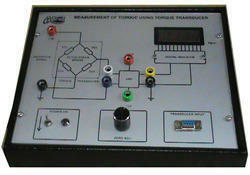 Temperature transducer trainer is unique in design as it covers, study of 4 different types of transducers. Experiments covering fundamental characteristics of transducers and study of transducer controlled switching / alarm systems can be performed. The manual consists of various chapters covering Introduction, Theory Types and selection of transducers, their applications and Glossary of terms. The trainer is enclosed in a specially designed users friendly elegant powder coated metal cabinet with intelligently designed layout on imported acrylic panel, are some of its other features. ADTRON’S Characteristics of Thermocouple & applications demonstrates the characteristics of Thermocouple and its applications to measure the temperature. It also demonstrates the cold junction compensation technique. A special heating unit and digital read out to read mV output are all enclosed in a specially designed user friendly elegant powder coated metal cabinet with intelligently designed layout on imported acrylic panel. Sensor Calibration : ANSI type. Sensor Range : 0 to 4000C. System Range : upto about 700C. Actual Heating Process : Heating unit of 200W heating capacity ( using bulb ). Leveraging by the in-depth knowledge of this domain, we have been able to manufacture the finest quality of Torque Measurement Trainer. 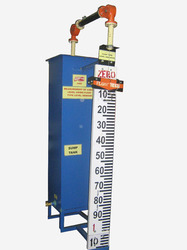 Owing to its overload protection and compact design, the offered torque measurement trainer is highly demanded. 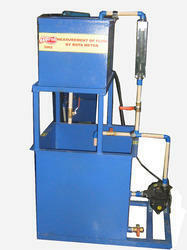 The offered torque measurement trainer is available with us at cost effective prices. ADTRON’S Measurement of Torque using Dynamometer trainer kit is a versatile self – contained stand alone unit useful in the study and demonstration of the principle and working of a Eddy current dynamometer and its application as a torque transducer. The trainer consists of an Eddy current dynamometer, 1/10th HP DC motor, Load cell, controller for dynamometer, RPM meter, and Torque meter. The trainer is enclosed in an elegant powder coated cabinet with a well spread intelligently designed layout on front panel. * Parameter Measured : Torque. * Measurement System : Eddy Current Dynamometer water cooled with water inlet and outlet nozzles coupled to motor. * Transducer Used : Load cell. * Readout : 3.5 digit digital display to read Torque in KgM. * Controls : 1. Multi – turn Load potentiometer with Dial. 2. Interlock of water flow switch. 3. 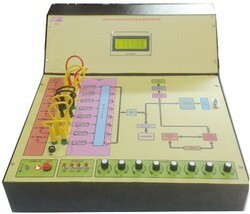 Electronic Controller for Dynamometer. 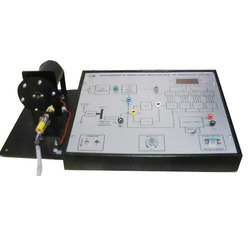 Universal Test Bench for speed measurement demonstrates the basic fundamentals of the various methods of speed measurment using various different speed transducers. The Universal Test Bench comprises of variac, universal motor and a guide bracket on which impulse wheel / sensing flange is fitted. Variac plays the main role by varying the voltage to drive the system. These speeds are further transmitted by using step-pulleys driven with the help of rubber ‘O’ rings. Three different transducers i.e. Magnetic Pick-up, Inductive Proximity Switch and Infra Red Sensor can be used to sense the speed and indicate on the same display with help of selector switch to read the speed in terms of RPM. Impulse wheel or sensing wheel is made in such a way that all transducers can sense at a time because the three sensors have different properties / characters i.e. Magnetic Pick up will sense only ferrous material, Inductive Proximity switch will sense all metals (any metalic Particle) and infra-Red sensor will sense reflecting stickers (reflection of light). 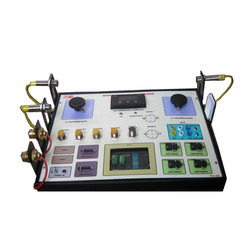 Arrangements are made to easily assemble, dissemble and interchange the transducers as and when required making the Universal Test Bench for Speed Measurement user friendly and convinent to use. Speed can also be measured with the help of analog tachometer by using AC Tacho Generator as a sensor and can also measure D.C. Voltage of D.C. Tacho Generator with the help of Digital Volt Meter (DVM). A wide selection of other various tranducers and attachments are provided making the unit completely self contained to master various methods of speed measurement. AC Tachogenerator generates AC Voltage proportional to speed. Permanent magnet is used as rotor, useful in measurement of speed and in feedback circuits. Rated Speed : 4000 rpm. Input : Shaft coupled to rotating element viz. universal motor with the help of pulleys and “O” rings as per convenience. Output : 20 V. at 1000 rp ml. Shaft Diameter : 10 mm. * With its stability and linearity, ATL’s cutting-edge sensor technology is setting new standards for teaching technology. * A sensor is a device which receives and responds to a signal or stimulus. A sensor differs from a transducer in the way that a transducer converts one form of energy into other formwhereas a sensor converts the received signal into electrical form only. Looking for Instrumentation Part ?